What if we could find a way to visualise the changes that take place inside the human brain in neurodegenerative diseases? Well, this speculation is not so far from reality, thanks to new research published in the journal Neuron this week. The Japanese paper reports the synthesis of a new radiological compound which can be used to track the progression of Alzheimer's disease in the brain. Alzheimer's - which is estimated to affect some 35.6 million people worldwide - is a degenerative disease in which sufferers slowly lose memory, cognition and movement. The disease is characterised by the formation of two unusual protein structures inside the neuronal cells of the brain: beta-amyloid plaques and tau protein neurofibrillary tangles. Tangles of tau protein have been of particular interest to researchers of Alzheimer's disease in recent years, as it is thought that the exact levels of this protein in the brain can be used as an indicator in the progression of the disease. We therefore need to find other ways of indirectly measuring the neurological processes which are going on during the development of this disease. There are a variety different imaging techniques that could be used to view activity inside the human brain, including MRI and CT, but the method utilised by this Japanese research group is known a Positron Emission Tomography (PET). To produce a PET scan, a radioactive compound - known as a tracer or ligand- is injected. The tracers used for PET are short-lived and decay to half their initial radioactivity in around 30 minutes. As each molecule of the tracer decays, its releases a positron; this in turn triggers the production of two gamma photons. Photons are then detected by the scanner. As more of these gamma photons are released, they can be used to build up a 3D picture of the object inside the scanner. What makes the ligand developed in this study, known as [11C] PBB3, unique is that it binds preferentially to the tau protein in the brain. 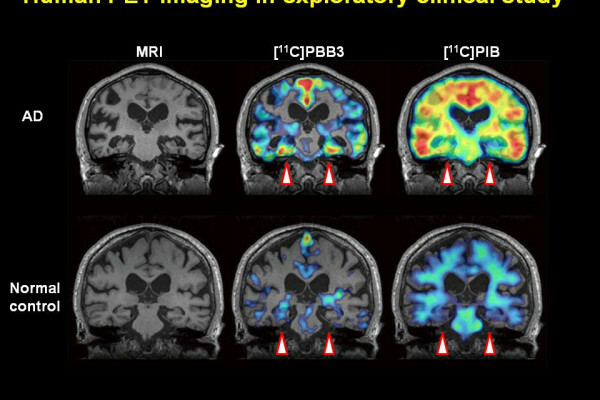 This means that when someone who has been injected with [11C] PBB3 is imaged in a PET scanner, the tau protein-containing neurofibrillary tangles in their brain will light up brighter than anything else, as they have more of the tracer bound to them.This can then be used to track changes in tau protein levels in the brains of people with Alzheimer's, and so follow the development of the disease. The radioactive ligand is currently still in design stages, but Dr. Makoto Higuchi, who led the study, is hopeful that we might see the drug used in the clinic in the near future - 'we are also developing so-called fluorine-18 labelled versions of the tau imaging agent, which should be more widely available among every PET facility' he explains, 'so that will hopefully be established within 5 years, in our tentative plan'.